Garage sales were a little disappointing this week. Only found one worth stopping at. I found this really cute little pitcher for $1.50. It will hold a full quart, so it is bigger than it looks in the picture. I always need another white pitcher, right? Since garage sales were a bust, I headed for my favorite discount fabric store and found another gorgeous piece to mix with my main pillow fabric. The orange is my base fabric, and I have a solid navy, lime green and some more oranges. I wanted another pattern in the mix. This navy and cream will be perfect and for just $3. yd. I had to have some. It's a beautiful P.Kaufmann heavyweight silk blend fabric that I saw at another store in a different color for $39.99 yd. Since Ross is close to the fabric store, of course I had to stop there. 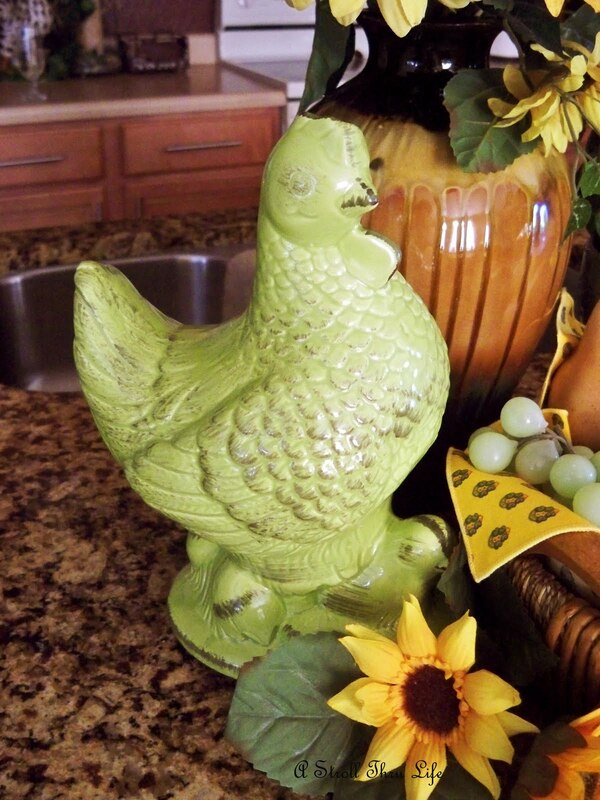 Love this really cute lime green chicken. I know, I am really into lime and orange. But, isn't it just the cutest thing and so bright and cheery. It's so different too, not your normal chicken. For this price, I just had to have him. One more block away is Hobby Lobby, so why not stop there too. All of their fall decorations are on sale for 50% off. Well, of course I just had to bring this little white guy home. So cute. He was $4. That's it for this week. Thanks so much for stopping by. I really appreciate your visits. Hi , Marty.You always bring news! Lovely that white pumpkin!Hugs.Fatima-Scrapart. No Marty, that's not your normal chicken, but she sure is cute!! I would have brought her home as well. Your fabric find is beautiful and I would love to see it made up. Love your finds! I just might be taking a ride to Hobby Lobby today! I love that white pumpkin, so cute. I saw that same little chick in Ross!! SO CUTE! How did I not know that the Fall stuff was 50% off? I guess a little trip to Hobby Lobby will be on my agenda for tomorrow! I think I'll pop over to your house, get some inspiration for Fall, and hit the Hobby Lobby while I'm there! WHY DOESN"t CALIFORNIA HAVE HOBBY LOBBY????? You always find such cute things! I love that orange fabric!!! Gorgeous! And the lime chicken and white pumpkin are extra cute! I love that the chicken is green! Great buys Marty! that's the cutest green chicken - it must be a one-of-the-kind! Love your lime green chicken!! What a hoot!! That's one cute chick! 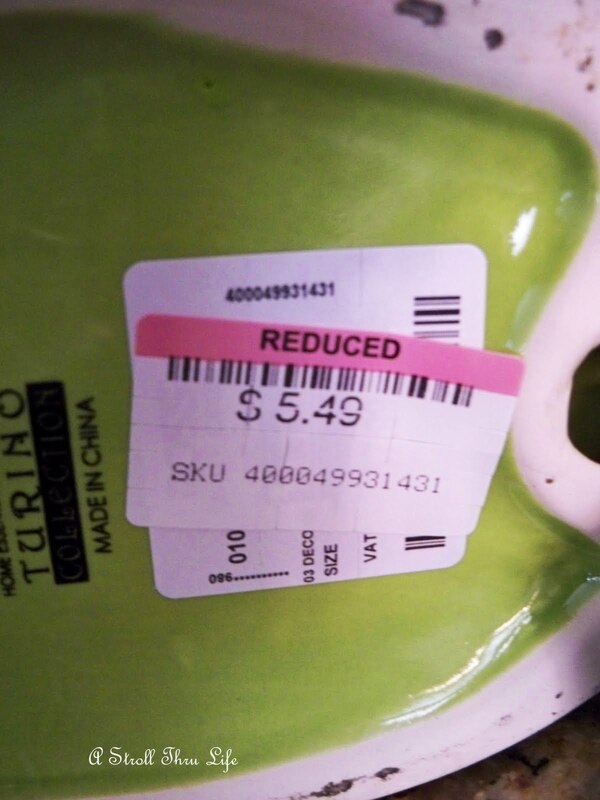 Maybe it's a good thing that the garage sales were a bust, otherwise you might not have stopped at the other stores. I just found out that we have a Hobby Lobby in Idaho!! Great finds this week Marty! 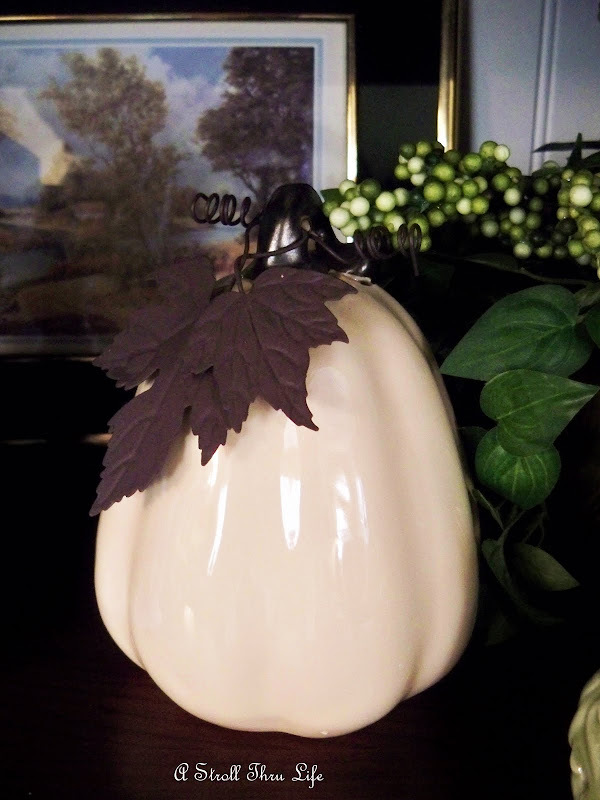 I absolutely love decorating with white pumpkins. The one you picked up at H.L. is gorgeous! I'm grabbing my purse and heading to Hobby Lobby! I usually wait too long and then have to celebrate vicariously through friends who went early and got the good things. Thanks for the reminder. I see you have found more beautiful things for your lovely home. I like that lime green rooster. He's cute! Love the white pumpkin too and the pitcher. I'm sure they will find their way into one of your lovely tablescapes. You did great Marty, love your finds, they are always great! Would all look good in my house! I need to pull my stuff out, but will wait just a bit longer...like this weekend! I love that white pumpkin! No, that isn't your normal chicken...he's cute! Oh, you did really good Marty! 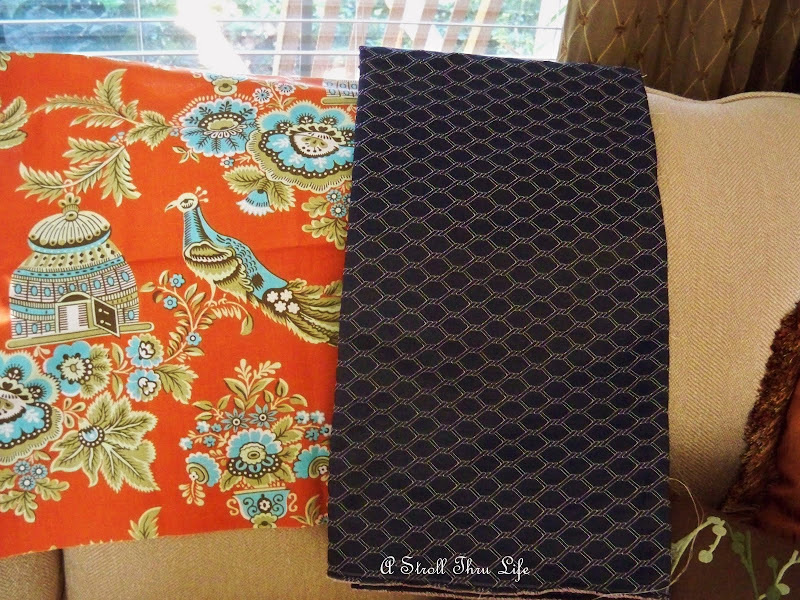 I love P Kaufman fabrics and I know how expensive they can be! Your's will look gorgeous as pillows! And the lime green rooster is so darn cute! 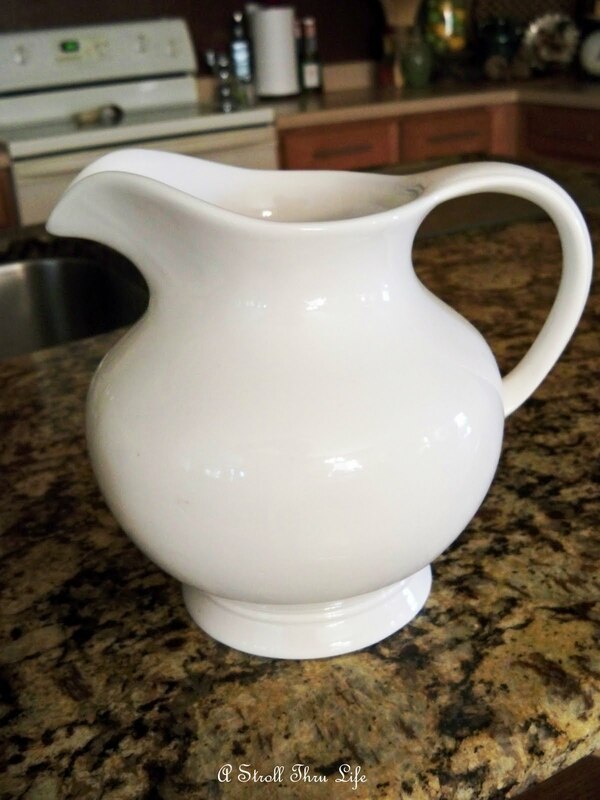 I have a white vase identical to your garage sale find...I also got mine at a garage sale...can you believe it? 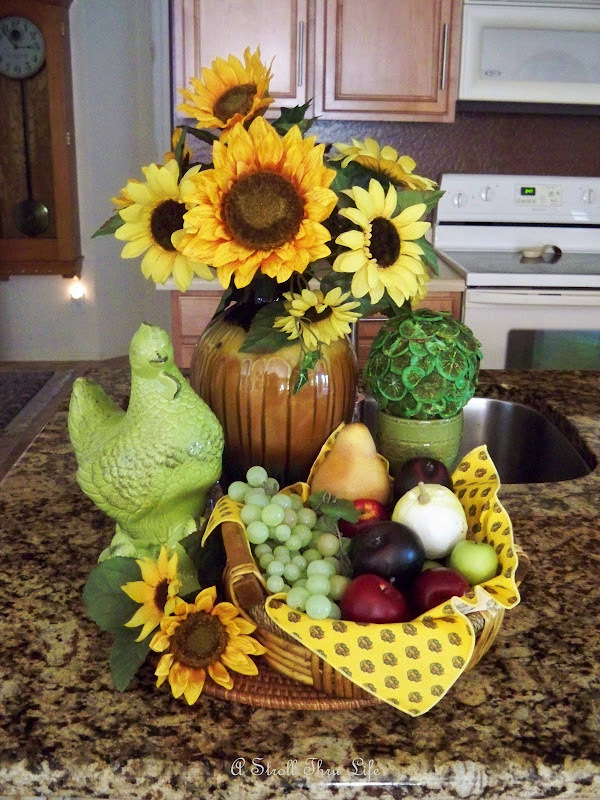 I love your lime colored chicken...it really makes the grapes pop out in your photograph...so pretty for fall. I am a new follower of your blog...it is lovely. Have a great day...Sue, Sprucevale Cottage. I love your new fabric. It coordinates beautifully with your orange base fabric. I think that you are correct in that you can always use another white pitcher. BTW I LOVE that pumpkin!! I love that pumpkin! Next week the pumpkins are coming out at the Cape House. Can't wait! Marty, now I have to climb in the attic and start bringing down the pumpkins. Too cute. You have great style. That navvy fabric is going to make beautiful pillows! Haha! I mean, YOU are going to make beautiful pillows with that fabric! Very nice quality for sure. I like the diamond pattern that loops on it. I hope you know I adore that lime green chicken though. I love Ross! I frequent ours quite a bit and see lots of chickens but never a lime green one. So cute!